1. Cleanse: I use Cerave Foaming Face Wash morning and night. It's an excellent, no-frills facial cleanser that's quite gentle on my sometimes-dry and sometimes-sensitive (thanks to prescription topical products for acne) skin. I've even converted K to using it, instead of the Purpose facial wash he used to use. On the rare days when I wore makeup, I'll soak a cotton pad with the Garnier Skinactive Micellar Water (it's basically as good as Bioderma) and use that to remove my makeup before washing with Cerave. 2. Prescription Product: In the morning, I alternate between Acanya and a compounded topical spironolactone and clindamycin. In the evening, I use Retin-A Micro 0.1%. The dermatologist actually recommended that I apply the Retin-A Micro after moisturizing, but it balled up and wouldn't absorb into the skin that way, so I've switched to applying it before. 3. 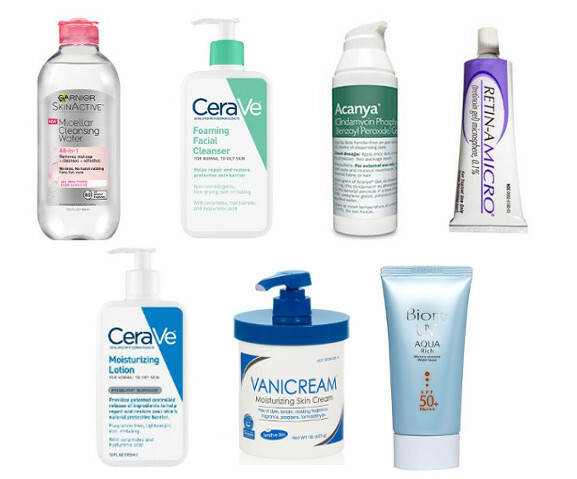 Moisturize: I've always looked to very basic drugstore moisturizers. In the morning, I use Cerave Moisturizing Lotion and in the evening, I use Vanicream. 4. Sunscreen (Daytime Only): At the moment, I use the Biore Aqua Rich Watery Essence, though I may end up needing to find a new one soon, as it was reformulated in early 2017. While I've seen mixed reviews about whether the new one is worse or better, it seems clear that the new formula is noticeably different (other blogs compare the old and new here and here). Most of the Amazon sellers have, as late as June of this year, still been shipping the old version, but at some point, they'll run out. I'm open to trying the new version at least once, so I'll keep ordering until I get the new formula, and then try it and see. As for how I like my new routine? When I posted in June, I had added the new presriptions and stopped using my CosRx BHA (cheapest on Amazon) and Timeless C + E Vitamin C serum, but was still using the other moisturizing products in my original routine, such as the Hada Labo moisturizing toner (cheapest on Amazon), Josie Maran argan oil light, and the CosRx Snail Mucin Power Essence (cheapest on Amazon). Removing those items was another big change. As with the last time, there are upsides and downsides to the new routine. As is usual for me, alas, perfect skin is still not within reach. The upsides: Removing all of the other moisturizing products from my routine has definitely made the prescription products more effective. The healing time required for my blemishes and bumps (took several weeks before I started BHA, shortened down to five days to a week on BHA) has become even quicker, usually taking about three days now, for most. They also don't swell up as much or come to a head. The dark spots remaining after blemishes also seem to heal about as quickly as they do when I'm using a vitamin C serum. My skin generally looks fine and is not overly dry despite the minimal moisturizing steps. The downsides: I still miss my over the counter BHA! Acne-wise, I get painful, inflamed spots significantly more often than when my old routine was at its most effective, about once a week as opposed to once every six. (Most of those bumps go away much more quickly now, and don't get to quite as icky an extent as on my old routine.) The overall appearance of my skin is also less nice, the tone's a bit less even, there's more redness, it looks a little dryer, and I don't have quite the same "glow" I often had with my old routine. Whereas I sometimes didn't think makeup (thanks to my rudimentary skills) improved my skin's appearance on good days on my old routine, I definitely benefit more obviously from makeup now. My new job comes with a new insurance plan that doesn't allow me to continue seeing my current dermatologist, so my experiment with dermatologist treatment will end soon. I'll stick to this minimalist skincare routine for a while longer, while I think about which steps I want to add back in. While I miss a lot of my old products, I'm also sure that I don't need every single step in my old routine, and that some of thse were just "fluff" that wasn't bringing much benefit. How many steps are in your skincare routine? Have you noticed big differences when you either significantly cut down or added to your routine? Readers made some great suggestions on my last skincare post, including cutting dairy products out of one's diet, which does make a big difference for my acne, but isn't enough to get me to "perfect skin" status.